Baking Pan Poles from Logam Jawa recommended for the baking lover. Made from aluminum which is the best heat conductor. Aluminum body is designed by using glossy-finished polish on the outside and satin-like finished polish on the inside. Equipped with glass ring aluminum lid used for monitoring the cake while baking. Always grease Bakeware with oil or butter for best results. 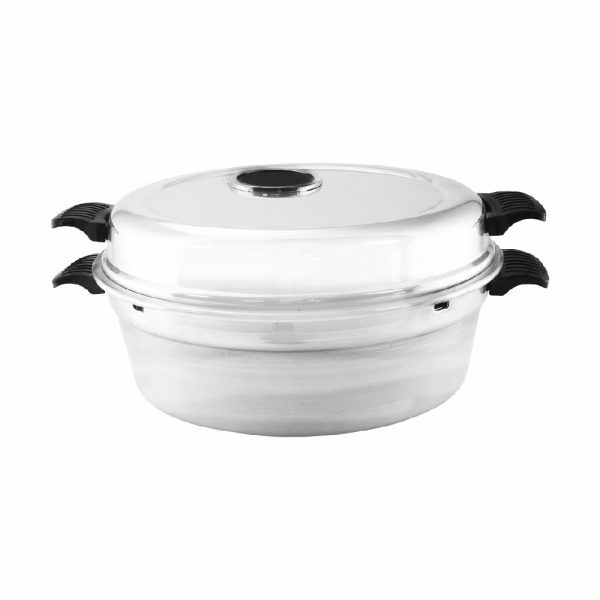 The direct ignition on the stove will be conducted by the high-quality black chrome coated carbon steel. The aluminum tray used for the finished cake or can also be used as the baking pan placemat. Before using for the first time, wash with warm water, dishwashing soap and a soft sponge. Bake on medium or low heat. Aluminum and carbon steel is a good conductor so it is not necessary to cook at high temperatures which will cause colors change on the surface of the Baking Pan. Allow the Baking Pan to cool completely before washing. After washing, dry each part of the Baking Pan with a dry cloth. Better not to use metal utensils that can damage or scratch the inner surface. Store the Baking Pan carefully, avoid direct contact with metal or sharp objects. Place the inside upside down when storing to prevent dust and odor.